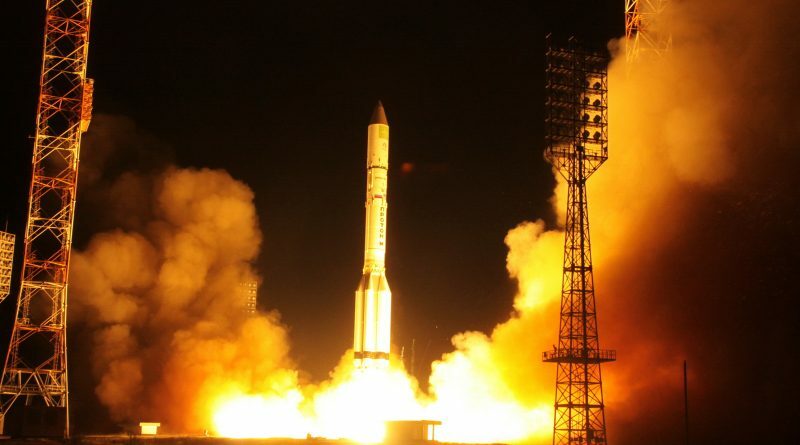 Embarking on its third mission of the year, Proton blasted off from Site 200/39 at 19:23 UTC and the three-stage rocket performed admirably, dispatching its Briz-M upper stage on a mission of over nine hours to sequentially raise the vehicle’s orbit to drop the 5,900-Kilogram payload off in a Geostationary Transfer Orbit. 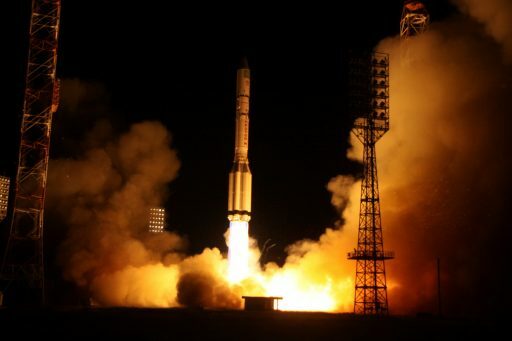 Spacecraft separation occurred at 4:35 UTC on Tuesday into the planned orbit after a nominal five-burn ascent mission by the Briz-M.
Monday’s Proton launch was the third flight of Russia’s current heavy-lift workhorse in 2017 – a year largely dedicated to rebuilding as Proton hopes to overcome reliability issues suffered over the last decade following extensive design reviews and a year-long grounding to sort out systemic engine issues on the vehicle’s second and third stages. The year-long gap in launches was the result of a close call on last year’s Intelsat 31 mission which suffered a premature shutdown on one of its four second stage engines which led to the discovery of a potential weak point in a batch of engines that used an improper solder material. Engines were re-called for replacement of their gas generators in early 2017 and Proton’s manifest for 2017 was re-aligned with return to flight occurring in June on a commercial mission with EchoStar 21 followed by a flight in the interests of the Russian Defence Ministry in August that delivered the Blagovest 11L satellite as the first in a four-satellite dual-use communications constellation for military and civilian applications. Another two Proton missions are left on the manifest in 2017, targeting September 28 for the launch of an ILS Proton with the AsiaSat 9 communications satellite and the second Blagovest is aiming for liftoff in December. Final preparations for the 415th launch of Proton got underway on August 8 when the three-stage rocket departed the Khrunichev manufacturing base in Moscow via train, headed to the remote Baikonur Cosmodrome in Kazakhstan. On the same day, an Antonov cargo aircraft touched down at the Jubileiny airfield of the Cosmodrome, delivering the Amazonas 5 satellite after a trans-continental flight from its California-based manufacturer, Space Systems Loral. Telecommunications provider Hispasat selected SS/L in 2015 for the Amazonas 5 satellite as an early replacement for the Amazonas 4A satellite that launched in 2014 and suffered a power system failure shortly into its planned 15-year mission, reducing its capacity and shortening its life expectancy. ILS received the launch contract for Amazonas 5 in late 2015, originally aiming for a Q1 2017 liftoff that was eventually delayed to July and again to September as Proton moved through its return to flight effort. 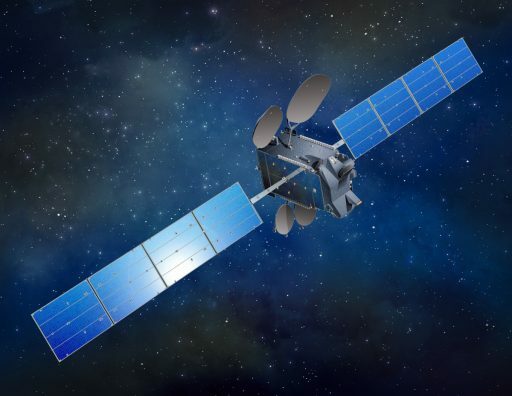 Amazonas 5 will operate from Hispasat’s Americas location at 61° West in Geostationary Orbit, delivering TV services to Latin America and Brazil via 24 Ku-Band transponders and Internet connectivity to South and Central America via 34 Ka-Band beams with high-throughput characteristics. 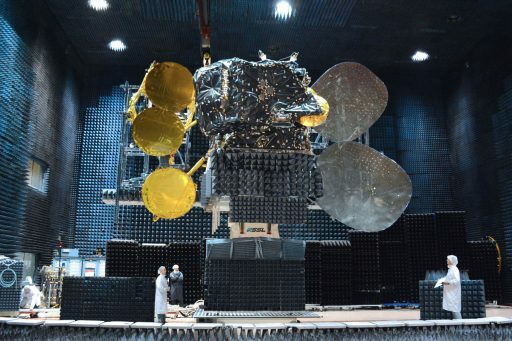 Using the popular SSL-1300 satellite platform, Amazonas 5 will operate for at least 15 years as Hispasat’s fifth satellite operating under the Amazonas designation to deliver services to the Americas while satellites named Hispasat cover Europe and Africa. After arriving at the launch site, Amazonas 5 went through a final set of stand-alone tests followed by propellant loading for flight and integration atop the Briz-M upper stage that is carrying it into orbit. While at Baikonur, Amazonas 5 passed by AsiaSat 9 in the processing hall which itself was deep in its launch campaign for launch just two and a half weeks after Amazonas 5. 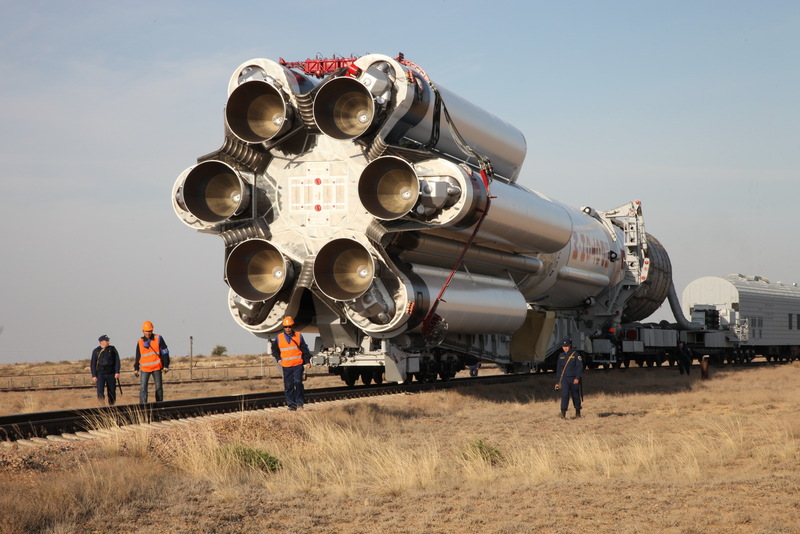 The Proton rocket arrived at Baikonur on August 18 and underwent integration at the 92A-50 assembly hall. Encapsulated in the 4.35-meter diameter payload fairing, Amazonas 5 and Briz-M were mated to the Proton rocket prior to rollout to the Briz-M fueling station on September 7 where the upper stage received nearly 20 metric tons of propellants. On Friday, Proton was rolled to the launch pad at Site 200/39 and took its vertical launch position for three days of final tests before heading into countdown operations on Monday. The lengthy countdown began with the activation of the Briz-M upper stage at T-11.5 hours for the upload of its flight software holding all the instructions for the upper stage’s nine-hour mission including burn and orbit parameters. 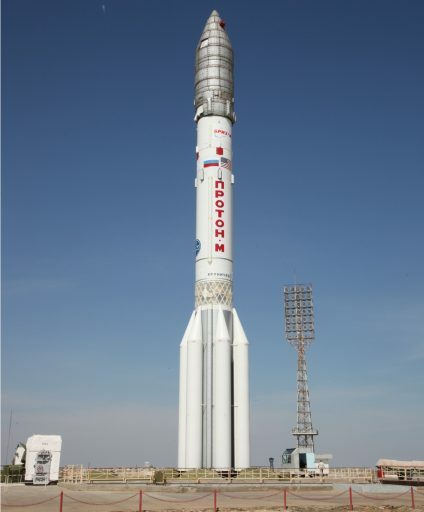 Proton was powered up seven hours before launch and the launch pad was cleared by all non-essential personnel for the three-hour propellant loading sequence at T-6 hours. Being loaded for flight, Proton received some 622 metric tons of Unsymmetrical Dimethylhydrazine and Nitrogen Tetroxide. After fueling was complete, the launch pad was re-opened for the finishing touches on the Proton launcher and ground facilities as the rocket was revealed on its pad one hour before T-0 when the large Service Structure was moved to its launch position. Amazonas 5 finished final preparatory steps half an hour before launch when switching to battery power and Proton entered its final countdown sequence at T-5 minutes with the insertion of the launch key – a relic of the rocket’s ICBM roots. Proton switched to internal power, pressurized its tanks and assumed control of the countdown at the T-1:53 mark followed by a final vehicle health check at T-3.1 seconds to clear the way for ignition. Proton started breathing fire at T-2.5 seconds when its six RD-275M engines fired up, initially going to a 40% thrust level before ramping up to a launch thrust of 1,014 metric-ton-force. 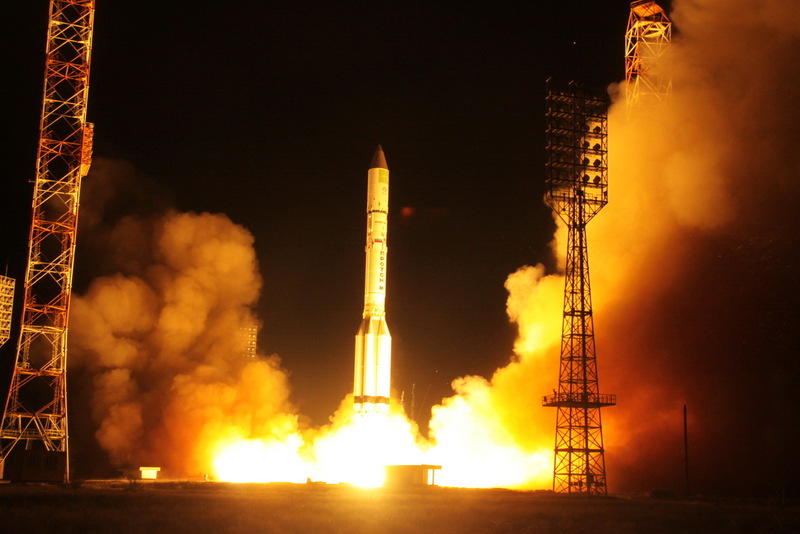 Liftoff occurred at precisely 19:23:41 UTC when Proton’s thrust overcame the rocket’s launch mass of 712 metric tons, lifting it off the ground and sending it into the night. Turning night into day, Proton rose from its launch pad and balanced in a vertical posture before initiating its pitch and roll maneuver to align itself with a 61.3-degree launch azimuth, departing Baikonur to the north east toward the Russian-Kazakh border. Burning 3,500 Kilograms of propellant per second, Proton quickly passed the speed of sound and encountered Maximum Dynamic Pressure one minute into the flight. By T+1 minute and 42 seconds, Proton only weighed half of what it did at liftoff, having burned the majority of the 419 metric tons of propellants held by its first stage at launch. The first stage exhausted its propellant supply one minute and 59 seconds into the flight, separating from the rocket’s second stage in hot-staging mode – igniting the second stage prior to firing separation pyros to let the engine exhaust push the spent core away. As the 21.2-meter first stage headed toward a crash landing 310km from the launch pad, Proton continued toward orbit with its four RD-0210/0211 second stage engines, generating 244,600-Kilogram-force of thrust. 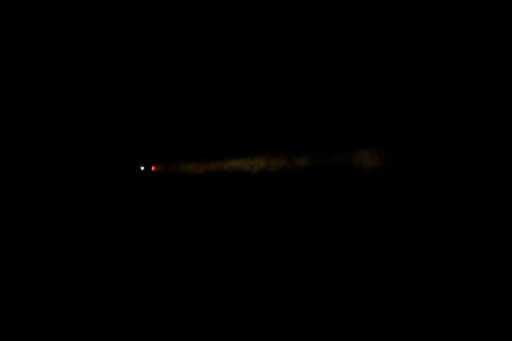 Real time calls made by the launch team indicated good performance of the second stage throughout its 3-minute and 28-second burn, consuming 156 metric tons of propellant. The hot staging sequence between stages two and three began at T+5:24 with the ignition of the four-chamber vernier engine of the third stage followed three seconds later by second stage shutdown and separation. Twenty seconds after the third stage assumed control of the flight, Proton jettisoned its two payload fairing halves. At over 100 Kilometers in altitude, aerodynamic forces could no longer harm the Amazonas 5 satellite, allowing Proton to shed two tonnes of no-longer-needed weight. Proton finished its job just shy of ten minutes into the flight – the third stage shut down its main engine at T+9 minutes and 31 seconds, the vernier followed suit ten seconds later and the Orbital Unit – comprising the Briz-M and Amazonas 5 – separated from the carrier rocket at T+9:42. Tasked with a five-burn, nine-hour mission, the 22,170-Kilogram Briz-M started out with a stabilization maneuver and a minute and a half of coasting before firing up its 2,000-Kilogram-force S5.98 engine for a planned burn of four minutes and 24 seconds. 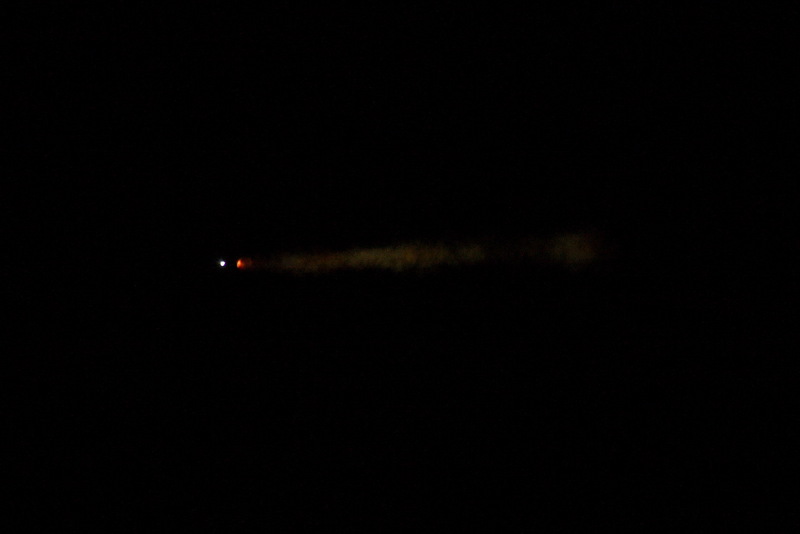 This initial burn was to transition the Briz-M from a sub-orbital arc into a Low Earth Parking Orbit of 170 by 186 Kilometers, inclined 51.6 degrees. Next up for the Briz-M was a 52-minute coast phase to conduct its second burn on the ascending node of the orbit – stretching from the the South Atlantic across the African continent. 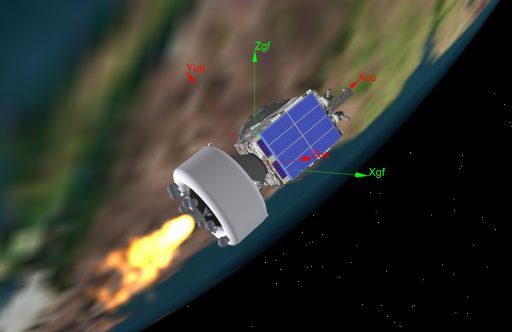 The 17-minute and 53-second engine burn was to raise the high point of the orbit, aiming for a 270 by 5,000-Kilometer orbit, inclined 50.3 degrees. Due to the relatively low performance of the Briz-M engine, orbital mechanics do not allow an economical raising of the apogee in a single pass given the long burn duration that would be necessary. Therefore, Briz-M performed two apogee-raising maneuvers, separated by a coast of nearly an entire orbit. The third and fourth burn were to be performed as a pair – starting at T+3 hours, 28 minutes and 22 seconds with an 11-minute and 52-second main engine firing, followed at T+3:41:04 by the separation of the torus-shaped Auxiliary Propellant Tank that will have had depleted its 14,600-Kilogram propellant load by then. The 5-minute and 41-second fourth burn targeted an orbit of 417 by 35,302 Kilometers, 49° for a lengthy coast phase of five hours and one minute to allow Briz-M to reach the high point of the elliptical transfer orbit where inclination reduction comes at less fuel expense. Burns 3 & 4 stretched from the West Coast of South America to North Africa. Firing up again eight hours and 49 minutes after launch, Briz-M was tasked with raising the orbit’s low point and reducing its inclination. The 6-minute and 28-second burn was targeting a Geostationary Transfer Orbit of 4,450 by 35,286 Kilometers at an inclination of 22.9 degrees. 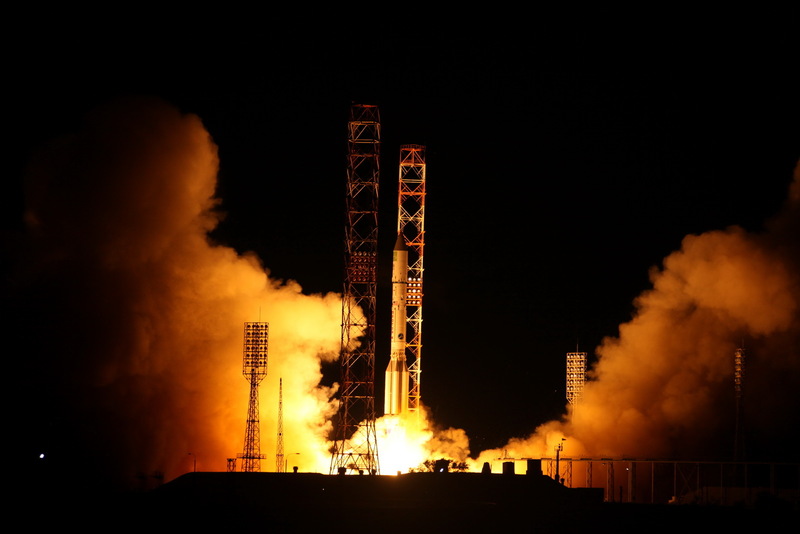 Loaded springs pushed Amazonas 5 away from the Briz-M nine hours and 12 minutes after liftoff – 4:35 UTC on Tuesday to check off Proton’s third success of the year and mark the completion of the 95th ILS Proton mission.